Join us for the 30th annual Welcome Pierre on March 9th from 6:30 to 8:30. Hosted at the exclusive rooftop bar of the Graham Georgetown, tickets are getting scarce. Major L’Enfant’s arrival in Georgetown to design the Federal City on March 9th, 1791, was both unexpected and unheralded. Join this group of local history lovers to make up for that oversight and properly “Welcome Pierre” with a gathering and a grateful toast to the designer of our Unique National Capital, a local tradition in its 30th year. 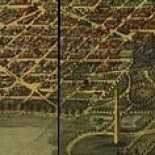 This entry was posted on February 28, 2019 by dchistorystuff in Early Washington DC, George Washington's Washington, Georgetown, Pierre L'Enfant, Welcome Pierre.